We knew this was coming. This August the rains have come with a vengeance. But we knew something like this was coming. In 2014, the Intergovernmental Panel on Climate Change published its summary of the expected impacts of climate change. In dry, academic language, the report sets out the evidence: climate change will bring extremes of precipitation: more droughts and more deadly floods. Early in the morning on 14 August, heavy rains in Freetown, Sierra Leone triggered a mudslide. Muddy rubble cascaded down the hillside, destroying homes and burying people inside them. The official death toll from this tragedy has now risen to over a thousand. At the same time, monsoon rains were causing deaths in India and Nepal. In Himachal, two buses with their passengers were swept into a gorge in a landslide. Fatalities from flooding are not uncommon in the summer monsoon season, but this time the heavy rains just kept coming, leading to extraordinary flooding in Nepal, northwestern Indian states and downstream Bangladesh, where the floods submerged over a third of the country. By 24 August, official estimates were 41 million affected across the three nations of India, Nepal and Bangladesh and at least 900 killed. The next day the reported death toll had risen to 1200. And yet this catastrophe was barely reported in the western media. Meanwhile, a storm was brewing off the southeastern US coast. Having been downgraded to a tropical wave, Harvey picked up energy again and regained hurricane status as it moved across the abnormally warm waters of the Gulf of Mexico. It also picked up unusual amounts of moisture. As it hit Houston and surrounding areas of Texas, there was no lack of media attention this time. 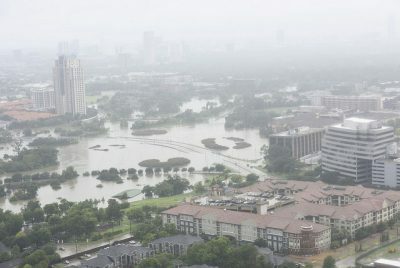 Experts had warned that Houston was particularly vulnerable to flooding in a warming climate because of several factors. In a low lying plain, with poor draining clay soils, and with the expanding city laying down ever more concrete, the water management plan is in no way fit for increasing storm risks. But this was a storm that would overwhelm even the most well-prepared city. In the first 72 hours over a metre of rain fell in some areas. Dramatic photographs showed freeways turned into deep rivers, while stranded families sent out desperate pleas for rescue on social media. Just days earlier, Donald Trump had signed an order scrapping stricter rules around flood risk for federal investment in infrastructure. As Harvey’s rains fell, Trump’s top official at the Environmental Protection Agency, Scott Pruitt, dismissed the subject of linking the storm to climate change. When asked in an interview, Pruitt described those discussing cause and effect as ‘opportunistic’. So there may be no immediate impetus from disaster to climate action. The media plays an important role here. There are three ways that media can let us down in reporting climate change-influenced disasters. The first is when the media give prominence to events which are easy to report, rather than those which are truly significant. Harvey is a significant story deserving major coverage. Yet before Harvey hit Texas (and hit the headlines), where were the reports on the South Asian flooding? Even given the general tendency to treat the deaths of poor people in non-western countries as non-newsworthy, the death toll was then climbing towards a thousand and 41 million affected across three countries. But someone actively following the news could easily be completely unaware of these floods. The story was given cursory coverage then dropped completely out of the news for at least five days, to be picked up again on 29 August, this time more widely. The second weakness is a failure to be upfront about the links between these disasters and climate change. In the case of Harvey, there are at least three links. One of the most significant is that the warmer than normal waters in the Gulf of Mexico contributed to Harvey’s heavy load of atmospheric moisture. In the first five days, it dumped some 20 trillion gallons of water on Texas (one sixth the volume of Lake Erie). Warm waters also give hurricanes more energy. Another factor is that storm surge along the coast rides on top of raised sea levels. These are particularly significant on the Gulf Coast of Texas – sea levels there have risen over 30cm in 50 years. One difficulty journalists have in reporting climate change is sustaining interest in a vast slow-motion catastrophe that plays out over a timescale of decades or more. But right now the drama and tragedy is immediate, and there is no excuse for not being clear about what is at stake and the choices we are making. The final way the media can fail in their coverage is not to stick around. Flood waters make for dramatic photography. But what comes next can be just as devastating. With a lack of clean water, the displaced people of Bangladesh, especially the children, are at risk of deadly diseases such as cholera. Many victims of the floods have lost all their possessions. Bangladesh was already experiencing food supply problems after flash flooding wiped out a large part of the rice crop in April. Now more vast areas of crops have been washed away. And although the US is a rich country, even there, for those who have least, it is hardest to get it back. A year ago, Baton Rouge, Louisiana was hit by one of the worst floods in US history. One year on, poorer neighbourhoods are still devastated. For them, and for the people of Bangladesh, climate change is already here. Will we pay attention? Claire James is the campaigns coordinator for the Campaign against Climate Change. She tweets at @campaigncc.